Imagine yourself in the middle of a forest in Costa Rica. Now imagine yourself standing there at night. And that’s what I was doing—for a few minutes anyway, before mercifully, we turned our flashlights back on—and resumed our night hike on one of the trails on the UGA Costa Rica Campus. In Costa Rica, nearly everyone is a biophiliac (defined as the love for nature). Ticos and Ticas (that’s what Costa Ricans call themselves), love nature and have a deep commitment to sustainability. To begin your Costa Rican journey, you too must become a biophiliac. It’s easy to do. First, you must shut up; observe not only with your eyes but also with your ears, nose, and touch. And then take a deep dive to complete your initiation—the night hike. In a small group of around ten people, we set out for a hike on the same trail that we had hiked on during the morning of our first full day in San Luis de Monteverde, but this time we left at 7:00 pm (well after the sun had already set). Along this hike, which took roughly two hours, I saw more animals (if insects count as animals) than I have seen on any of our other hikes during our stay. Our flashlights reflected in the eyes of mammals high in the tree. the wildlife, as I was more attuned to the things that our guide was silently pointing out rather than being distracted by a discussion of something else. My favorite part of the hike, however, was when we all turned off our lights and stood in silence for a few minutes. I could see nothing but the faint outline of the trees against the (very) dimly lit sky. I was at the complete mercy of the world around me, and there was no way of knowing what was lurking on either side of me. It was scary but oddly peaceful listening to the chirp of the cicadas and the rustling of who-knows-what in the underbrush in front of me. Maybe I was comforted by the fact that there were other people with me as well. 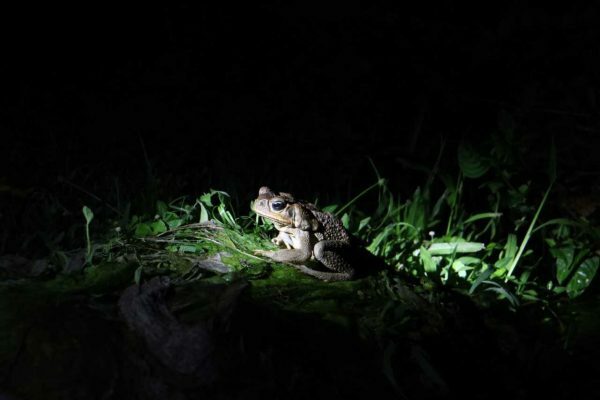 So, if you are contemplating leaving that air-conditioned home and that lightning fast Wi-Fi and coming down to Costa Rica, begin your journey with a silent night hike. To be surrounded by the stillness of nature and handicapped by the lack of vision is astonishingly peaceful, and I can’t wait to do it again. I implore you to reach out, contact a guide, and explore the forest of Costa Rica (or anywhere, really) to feel a connectedness and reach an understanding with nature that you have never felt before.